I’m sure we’ve all felt the sting of being under appreciated at work. You stayed late, you finished those extra reports, you responded to those emails, you filed those papers; maybe you even cleaned up the office. And the next day, it feels as if no one noticed; the office is, once again, a mess. Now imagine this scenario: you are less than an inch tall. Your job is to visit and tend to hundreds of clients every day, and report all gains back to your busy and dominating boss. Your extensive efforts provide the means to feed humans around the globe on a daily basis, and numerous other species as well. You work tirelessly in the heat for no pay. And what do you find in return? Your clients move without warning, your business fades, and you notice a sudden rash of health crises within your company, putting you dangerously close to falling out of business for good. I’m talking about the invaluable honey bee. Although they may not understand the concept of being overlooked, the honey bee is arguably the most under appreciated worker on the planet. In addition to pollinating endless species of flowers to ensure their survival, studies performed by the U.S. Department of Agriculture have revealed that honey bee pollination provides us with 1/3 of all foods we consume. In a more specific evaluation, the Department showed the extent to which certain foods depend on honey bee pollination for survival: peaches rely 80%, cotton relies 80%, apples depend 90%, and almonds depend 100% on pollination for production. What’s more, these four treasured products only scratch the surface. 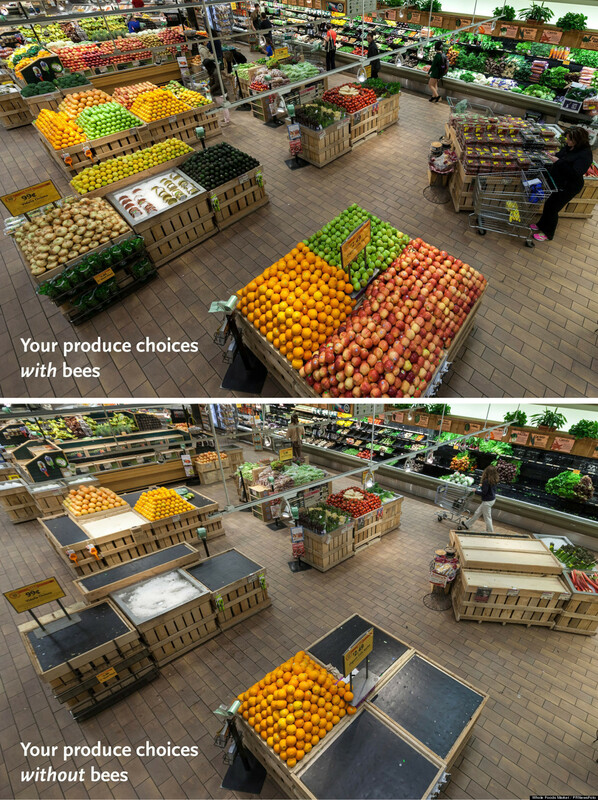 Based on this information, it’s safe to say that our grocery stores would look entirely different without the beneficial work that honey bees provide. The image below demonstrates the impact bees have on the foods we eat every day (learn more about this project). The recent fuss over the honey bee is stemming from a previously unexplained rash of colony disappearances. Detailed studies from Harvard University and more have revealed that the growing rate of deaths is directly linked to the use of insecticides in agricultural and farming practices. In particular, neonicotinoids (the most common and widely used insecticide) proved in a study by Harvard University to have fatal results in half of the honey bee colonies tested. Combined with our frequent destruction of flowering plants on account of urban expansion, the bees have been presented with nothing short of a recipe for disaster. Put more simply, we have been unknowingly biting the hand that feeds us. Fortunately, despite the grim outlook for our small but mighty friends, there are several steps you can take to help protect the honey bee from an endangered future. If you have a backyard, put a bee box in your garden or a secluded area (so it’s safe for you too) to provide a protected space for a colony to thrive. Switch to planting bee-friendly plants (such as individual flowering plants and vegetables) and avoid using harmful insecticides. You can also purchase local honey to support safe-practicing beekeepers. And, of course, learning and awareness is always a good place to start. It’s hard to be under appreciated. Especially when you’re barely an inch tall. Maybe it would do us all some good to help pay a well-earned bonus to one of Earth’s best employees. This blog was written by SLCgreen intern Lauren Mills.